The webinar is one of the most powerful formats in the content marketer’s arsenal, and it’s used by 46 percent of B2B marketers (according to the 2012 B2B Content Marketing Benchmarks, Budgets and Trends research). Not only does it give businesses an opportunity to speak at length about a relevant topic, but it also gives them a platform from which to share key insight that helps extend the conversation long after the event takes place. What are key metrics and their benchmarks? How do you use your intel to convert more prospects into customers? 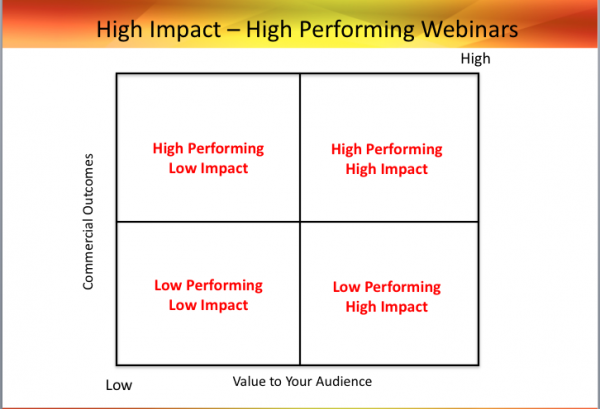 Agron began his presentation by asserting that the objective of a webinar is to get business results while offering a high value to the audience — a benchmark that Agron calls High Performance­-High Impact (HP-HI). This is the content marketer’s “sweet spot” for reaping the greatest returns on their webinar efforts. Objectives: What do you want to happen as a result of the webinar? For example, is your goal to bring in more sales leads, develop stronger thought leadership, or achieve better customer retention? Audience value: Is your content timely and relevant? Are your messages and information targeted to your desired audience? Success factors: What are your target benchmarks for the number of registrants and the number of attendees? 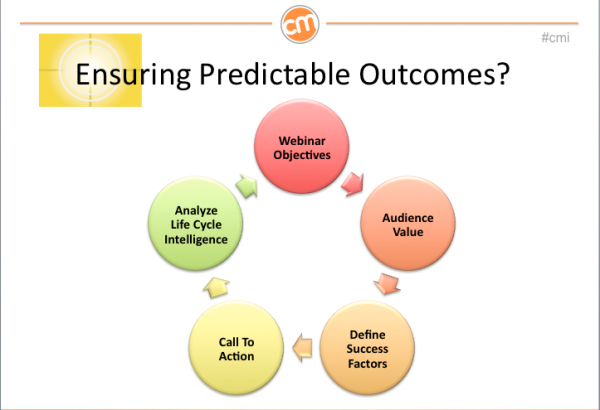 Calls-to-action: What do you want the audience to do after the webinar, and what are you going to do in order to ensure this happens? Analysis: How will you determine whether your objectives are achieved? One of the biggest benefits of the HP-HI webinar is that you create a relationship with your audience before, during, and after the event. Tip: Agron recommends you start tracking your data as soon as your registration page goes live. 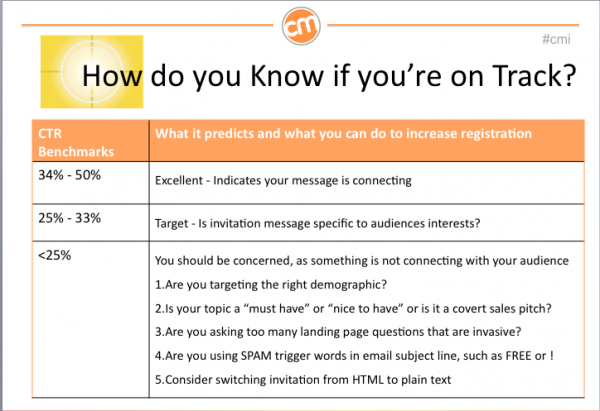 On target: A CTR of 25 to 33 percent; you are on target, but review your invitation message to make sure it is specific enough to your audience to improve your rate. Underperforming: A CTR of less than 25 percent; you should be concerned if you fall in this range, because it indicates that something isn’t connecting with your audience. Is the information you provide “must have” or just “nice to have;” is it just a converted sales message? Are you using words, characters, or phrases in your email subject line that might trigger spam filters, such as “free” or “!”? Agron advises content marketers to always look at the percentage of people responding, as well as how they vote, as this information can be used in follow-up conversations after the webinar. 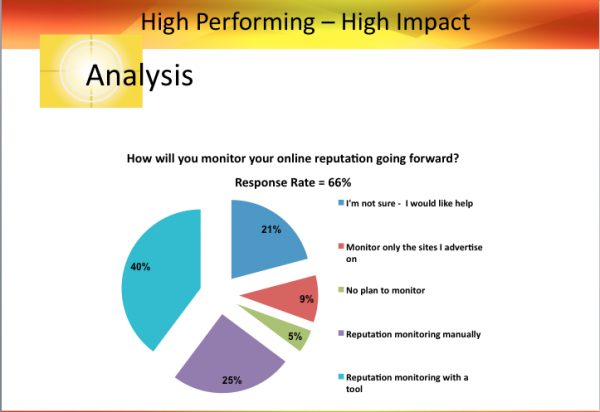 For example, in the poll below that Agron conducted, the knowledge that 40 percent of his audience wanted help on how to monitor their online reputations gave him a starting point for later outreach. Here, Agron feels it’s helpful to look at attendee counts at 15-minute intervals throughout the webinar. When it comes to his company’s webinars, “We want to see 80 percent of the peak audience is still there by the Q&A portion,” he says. Step 1: Archive a copy of the recorded webinar. Step 2: Within 24 to 48 hours, send a follow-up/thank you email and include valuable content, such as the slide deck, or link to reporting. Step 3: Do final registration, attendance, and performance analysis. 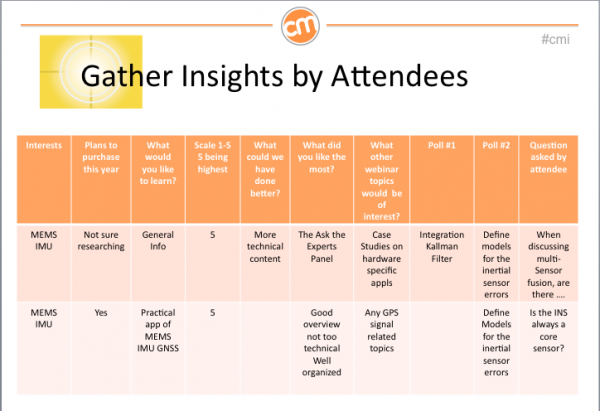 Agron also recommends marketers gather insights by individual attendee (see sample chart, below), including capturing any special questions they asked throughout the webinar process. “This way, when you follow-up, you can start a conversation that incorporates their questions, and you can integrate this into your marketing automation processes,” he says. If you missed the webinar, there’s still a chance for you to view the full presentation. Download 6 Key Metrics that Impact Webinar Performance: Before, During and After. Get more great insight from Mike Agron when you attend Content Marketing World on September 4 to 6 in Columbus, Ohio.